“I kept dreaming of a world I thought I’d never see.” Kevin Flynn (Jeff Bridges) tells his son in the establishing story scene of Tron: Legacy (2010). Having studied IMAX 3D extensively for the better part of a year back in 2008 this is exactly how I’ve been feeling ever since. With my hopes – and fears – for the medium on edge for the past two years, I feel as though someone has finally understood what the technology is capable of and, with Tron: Legacy, I believe they have created a stunning, yet still reserved, display of what wonderful visual and immersive spectaculars simplistic, narrative film can offer to enhance and (quite literally) expand upon its content. What interests me most about IMAX 3D is its relationship to the historical real and the way in which it uses immersion to enhance the comprehension of filmic content rather than just offer an entertaining experience in the first instance. With the recent spate of 3D films including a lot of crappy 2D to 3D conversion and an inordinate number of kids flicks I’ve been concerned for some time now that the medium would be lost to gimmick and glamour forever, subsequently failing to explore its more fascinating and significant relationship with tracing the historical real. Thankfully, Tron: Legacy has, in a compelling and incredibly innovative way, restored its trajectory to thinking through the links between history and experience and how any visual representation of the former requires comprehensive formal consideration to elucidate the theoretical and narrative ideas it holds. The original Tron (1982), in addition to being a childhood favourite for many a now adult who grew up in the ’80s, is an incredible vision, and subsequent historical document of what I like to call the “future past”. The “future past” in film is a depiction of futurism that documents a contextual comprehension of what the future might either look like or the capabilities they are expected of it, and thus, necessarily, it becomes immediately after depiction, itself a document of the past. Tron: Legacy is one film that I am absolutely certain will, like its original, come to be a document of its own contextual “future past”. 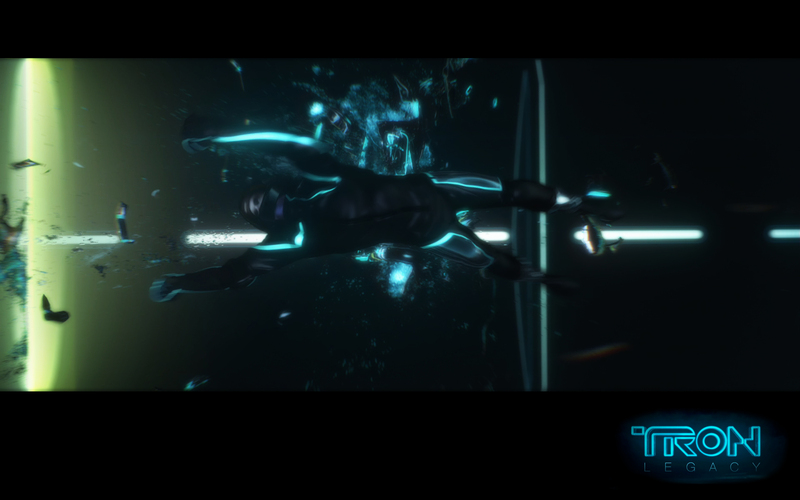 However, with Tron: Legacy (and indeed even Tron to some extent) the depiction of the “future past” is not so much in theorising how we might live in the future or what technological advancements might mean to society so much as it is a continuation of the contemplation surrounding interactivity and where it is that escapism intersects with real life. The idea that both films are predicated upon concerns sharing of or access to information. Given the technological revolution called the Internet that has arrived in homes during the time spanning the two films’ release dates, notions of sharing and access have never been more relevant concerns. The issue addressed however is mostly to do with the relational converse: control. All systems of power are built upon a relational set up and so for there even to be a question of “sharing” or “access” there must first be a structure that prevents this. Mirroring so very many times throughout the film are the structures of the real world – where corporations and authoritative figures are in control – and the structures of “the Grid” (itself a mirror image of the “games” played in the real world) where multiple mirror imagings occur; its own creator up against an image of himself. But perhaps most significant is his inability to return to the real world and even to any longer engage in the confines of his own creation. Set aside and decidedly “off the grid” both Kevin Flynn and his son Sam (Garrett Hedlund) occupy liminal spaces between reality and fantasy. Prior to entering the Grid, we have seen Sam as an outcast who has made a “home” for himself based upon extraction from the human world and their prescribed rules. The company in which he is the major shareholder, Encom, is nothing more than a bankrolling joke to him. In a wonderfully indicative bike chase sequence early on we see Sam ride in the real world as he will once he enters the Grid: recklessly and with enough balls and abandon to physically ride off an overpass, breaking the established barriers. 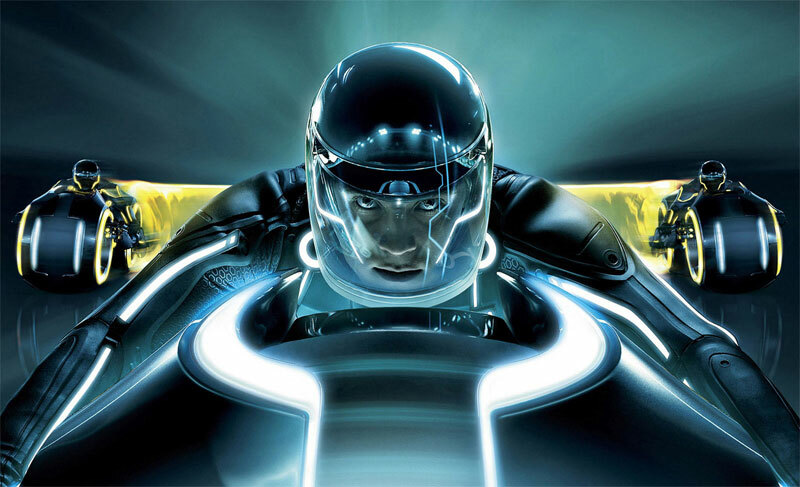 Just as Sam breaks through established barriers within the narrative; hacking into Encom’s system and posting their technology for all the world to see and passing through the boundaries between the real world and the digital one; Tron: Legacy itself repeatedly breaks cinematic boundaries, creating yet another mirror between form and content. From using the most visceral and immersive thirty or forty seconds of 3D I have ever seen in cinema as its opening shot (this honestly feels more like a simulator ride than a static viewing experience), to seven times in the film expanding the dimensions of the IMAX screen to allow for an enhanced and enlarged view of the spectacle, to seamlessly switching between 2D and 3D as and when the effects call for it yet never appearing gimmicky or clunky in doing so, Tron: Legacy is an exemplary exercise in experimenta. But returning to the narrative of the film and its relation to an historical real, there is one character in the film, Quorra (Olivia Wilde) who represents a new phase in the human/digital (r)evolution. Her role and what she represents suggests an internal evolution within gaming and the digital world. The implications of this are astronomical, particularly as she transcends the barrier between the real world and the Grid, leaving the film with “integration” as its final frontier. What Tron: Legacy is tracing here is the fascinating move from an historical document (Tron) to its conceived progression (Tron: Legacy) which then charters the transcendence of the real to computer generating and digital enhancement, through an onscreen evolutionary event and back to the real (diegetic) world. Both spatially and temporally this is an entirely new way of viewing historical representation and yet so wonderfully is in and of itself an historical document as it suggests to us; its own vision of the future for “user interactivity”, human/digital integration and a move beyond understanding history as a series of “events” and into understanding history as a constant, evolving process that occurs across a multitude of platforms and instantaneously through communicable affect. Whilst I appreciate it can be said of any film that it is in and of itself an historical document of one form or another, Tron: Legacy is unique in that its central call for viewing and experiencing cinema is as an onscreen process of evolution in interactivity, not just technologically speaking, but also with regards to the very linear understanding we hold towards historical discourse. “Sometimes life has a way of moving you past life and hope.” is what Kevin Flynn tells Sam towards the film’s end and I would venture that sometimes cinema has a way of moving its audiences past traditional and expected viewing experiences and the hope for what they might achieve. Tron: Legacy is not only an incredible and deeply affecting experience in immersive IMAX 3D (and it would remiss of me not to at least mention how truly awesome the Daft Punk soundtrack is at achieving a large proportion of that affect), but it is also a pioneering film for our continued understanding not only of modes of viewing experience, but also the way in which they construct contextual comprehension. Aware of itself to the last, Tron: Legacy is a signpost for what cinema can be and it is one of the most beautiful visions I have ever seen. Tron: Legacy is released in Australian cinemas on Thursday December 16 but despite wherever else it might be playing there is only one way to see this film and that is in immersive IMAX with 3D. For Melbournian readers of LV, you can see Tron: Legacy at the Melbourne Museum IMAX in Carlton and I implore you to do so.